For now, enjoy Car Play compatibility and new backup cameras. Mercedes-Benz's G-Class Wagon isn't changing for the future in the ways you might expect. Yet. From a preview event at Detroit's crumbling, historic Michigan Theater for the North American International Auto Show, chairman Dieter Zetsche was joined onstage by Arnold Schwarzenegger to talk about the iconic SUV's improvements. Given where Schwarzenegger used to hold office -- California -- and his environmental bend, The Governator had a pressing question for Zetsche: "What is the future [of Mercedes] in fossil fuels? 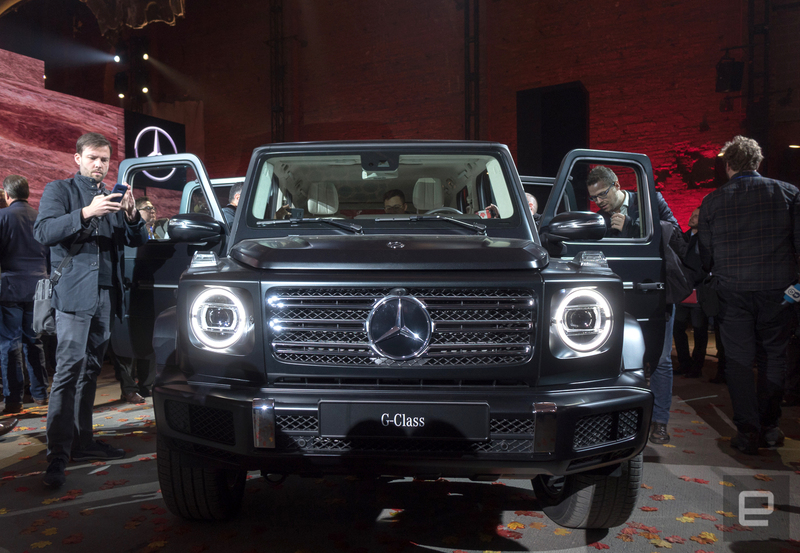 Does this G-Wagen eventually come out as an electric G-Wagen?" He has the world's first one at home in Los Angeles, he said. Zetsche's response was coy. Last year, the automaker announced that the future of Mercedes was all electric drivetrains. "Stay tuned," Zetsche teased. And then Schwarzenegger gave Zetsche a cowboy hat and the pair did a shot of schnapps. Other new bits for the SUV? An all new rear camera system, with two sensors -- one above and one below the spare tire. The lower is 100 percent waterproof to accommodate the G's new 700mm (27.56 inches) wading depth. There's also a new infotainment system, which premieres in the A-Class sedan, with Car Play and potentially other configurations (a demo wasn't available).